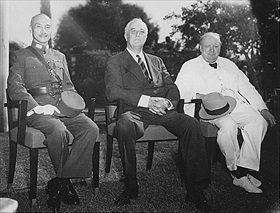 On this date in 1943 in Egypt, U.S. President Franklin D. Roose­velt, British Prime Minis­ter Winston Chur­chill, and Chi­nese leader Gener­al­is­simo Chiang Kai-shek con­tinued their series of talks during their Cairo Con­fer­ence (Novem­ber 23–27, 1943). Churchill and his party had hoped to estab­lish a way to deal with Soviet leader Joseph Stalin, who had declined an invi­ta­tion to meet in Cairo, forcing the “Big Three” to meet in Tehran, Iran, at the end of the month. From the British per­spec­tive, the Cairo meeting failed to achieve its aims. For one thing, Roose­velt, whose health was starting to deteri­o­rate, was edgy and with­drawn; he ignored the Stalin issue and focused the talks mainly on building up Allied mili­tary forces in the Far East suffi­cient to force Japan’s un­con­di­tional sur­render. The Ameri­can, British, and Chi­nese leaders agreed to con­struct long-dis­tance, heavy bomber bases in the China-Burma-India Thea­ter, and even­tually eight were built (four in India and four in China), starting with Cheng­du in Cen­tral China, 1,500 miles from Japa­nese soil. (By April 1944, the eight opera­tional bases were suit­ably advanced to begin nas­cent opera­tions against Japa­nese interests using B‑29 Super­for­tresses.) Churchill was clear that one of his pri­mary war aims in the Far East was to restore Britain’s rela­tion­ship with her colo­nies of Malaya, Burma, Hong Kong, and Sing­a­pore, all of which were now occu­pied by the Japa­nese. Roose­velt opposed these aims and was even more opposed to risking Ameri­can lives to shore up British interests anywhere outside the British Isles. In Tehran, where the two Wes­tern leaders were joined by Stalin, the three men com­mitted them­selves to opening a second front in France (Opera­tion Over­lord in Nor­mandy and Opera­tion Dra­goon on the French Riviera) in con­junc­tion with a Soviet attack on Germany’s eastern border (Opera­tion Bagra­tion). Expec­tation was that a second front would dis­suade Adolf Hitler from moving any military forces from Eastern Europe to France. Of long-lasting global signi­fi­cance were the various agree­ments in 1944 and 1945 reached by the Allied leaders and their repre­sen­ta­tives that nations in league with Ger­many and Italy would be divided into terri­tories to be con­trolled after the war by the U.S., Great Britain, France, and the Soviet Union. 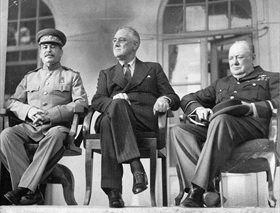 Right: The “Big Three” (l–r, Soviet premier Joseph Stalin, Roose­velt, and Chur­chill) on the portico of the Soviet Embassy during the Tehran Con­ference, Novem­ber 28 to Decem­ber 1, 1943. It was the first Allied con­fer­ence Stalin attended, and it focused primarily on stra­tegic coordi­na­tion among the Allies. Discus­sions covered the post­war divi­sion of Ger­many. In Octo­ber 1944 in Canada, Roose­velt and Chur­chill agreed to divide defeated Germany into occupation zones. 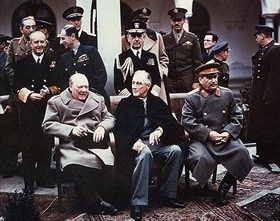 Left: Held in Soviet Crimea between February 4 and 11, 1945, the Yalta summit was the first Allied con­fer­ence that focused on the post­war world. The Allies agreed on an Allied Con­trol Com­mis­sion to over­see defeated Ger­many. Ger­many and Aus­tria, as well as their capi­tals, would be divided into four occupation zones—U.S., British, Soviet, and French. 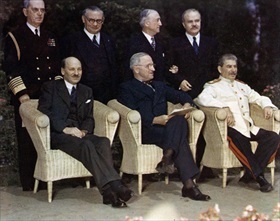 Right: With victory in Europe achieved, the Big Three (Stalin, Harry S. Tru­man repre­senting the U.S. following Roose­velt’s death, and Clement Attlee repre­senting Great Britain after defeating Chur­chill’s party in Brit­ish elec­tions) dis­cussed the sur­render terms for Japan during the Pots­dam Con­fer­ence, which was held near Berlin between July 17 and August 2, 1945. The Pots­dam Declara­tion, issued on July 26, 1945, with China’s approval, affirmed the terms of the Cairo Declara­tion (Novem­ber 27, 1943), but also required Japan’s uncon­ditional sur­render. Japa­nese sover­eignty was limited to four main islands (Japan’s “Home Islands”), and the country was to be occupied by the U.S. Armed Forces.